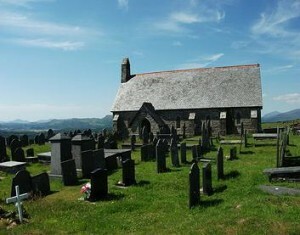 Overlooking Llandecwyn and the bay bellow, St Tecwyn's Church serves the communities of Llandecwyn & Talsarnau. Situated on a hill-top with rewarding views of Harlech Castle, the estuary of the Afon Dwyryd and beyond the Llŷn Peninsula. The current church dates from 1879 which replaced a much older church. The only remains of the old church are a small stone basin in a recess on the south wall and an 11th century memorial to Tecwyn, a companion of Tanwg and Cadfan. The site is ancient neolithic/ bronze age and is now part of the signposted Ardudwy Way. The Church derives Its name from St Tecwyn, who is believed to have arrived in Wales (together with St Twrog, patron saint of the adjoining parish church of Maentwrog in the Parish of Bro Moelwyn) from Brittany around the year 516 AD in the train of St Cadfan. The Church was almost entirely rebuilt on its former site in the year 1879, when practically every object of antiquity was swept away, with the exception of a small basin and the recess in which it stands on the South side of the altar table. The date seems to be the eleventh century. This stone is now safely embedded in the medieval wall of the Church. Note that the letters are minuscule and are not chisel cut, but indicated by a continuous row of dots, made apparently by nail and hammer. It was the custom in Ireland, and prol)ably in Wales, to carve the Roman alphabet on the tombs of teachers and missionaries.